Missouri's earliest exploration and development were fueled by two commercial enterprises. The first of these, the fur trade, is widely known and acknowledged. Americans seem to be at least generally familiar with the romantic saga of the traders and their exploits in penetrating the region's rivers and hills, dealing with the natives, and competing for territory and trading grounds. Less familiar is the story of the other great thrust of European enterprise on the Missouri frontier: mining. The passion to find and exploit Missouri's underground wealth, especially lead and iron ore, beginning with the French in the earliest years of the eighteenth century, was every bit as responsible as the fur trade for the region's exploration, and it was a greater factor in its settlement. The story of mining in Missouri rings with courage, innovation, and achievement, as well as with a measure of greed, exploitation, and abuse. We have here an epic tale of a process that fundamentally shaped the state. This important story needs to be told, and Missouri Mines State Historic Site is dedicated to that mission. Federal Mill No. 3 in Flat River, St. Francois County, was built by the Federal Lead Co. in 1906-1907, at a time when fifteen different mining companies operated in the "old lead belt" of southeastern Missouri. Surrounded by communities with names like Leadwood, Rivennines, and Leadington, this large industrial complex functioned as a processing center for the rich lead ores mined in the region. After 1923, the Federal Mill facility was owned by the venerable St. Joseph Lead Co., which had been active in the area since 1864, and it grew to become a major center of industry with twenty-six buildings and much large equipment spread over twenty-five acres. It was the largest plant of its type in the world, the hub of an enterprise with 1,000 miles of mine tunnels and 250 miles of underground railroad track beneath all the nearby communities. St. Joe had bought out all its competition by 1933 and was the sole employer for thousands of mine workers in the region. Around the middle of this century, after two centuries of productivity, the local veins began to play out, and St. Joe developed a"new lead belt" some thirty miles to the south and west around the tiny hamlet of Viburnum. The functions of the Federal Mill complex dwindled, and in 1972 operations ceased. In 1975 the expanded St. Joe Minerals Corp. offered the entire complex, along with over 8,000 acres of land, to the state of Missouri for recreational purposes. For several years the state wrestled with the problem of how to convert this huge acreage, much of which was covered with the unsightly remains of mining operations, into a public park. With proper facilities and management, much of the acreage offered a range of outdoor recreation possibilities. An obvious focus was on an already established pattern of use by off-road recreational vehicles on the most-altered lands, especially the broad expanses of sandy "tailings," the byproduct of ore processing. As plans proceeded to develop the park for these and other uses, the question still remained of what to do with the huge and now derelict industrial facility at the Federal Mill complex on the north end of the property. Some park professionals dreamed of a mining museum, and, indeed, before St. Joe pulled out it allowed park staff to select any items they wished to keep for a museum--a locomotive and ore cars, diggers, mechanized shovels, and drills. But the mill complex was still a big headache---an invitation to vandalism and injury, the many buildings mn-down and ugly (to some) and incredibly expensive either to renovate or to remove. Over time, park officials began to appreciate that this industrial complex, with its large number and variety of mining-related buildings, its many gigantic implements of industrial technology, and its location in the heart of one of the most legendary mining regions in the United States, ought to be retained in its entirety and developed to tell the story of mining in Missouri. What had been perceived by some as an awkward liability became transformed into an exciting resource and an interpretive opportunity perhaps unrivaled anywhere in the country. Once this fundamental direction was set, a long process of research and evaluation followed. Parks division staff discovered that the Federal Mill complex was even richer in interpretive potential than they had dreamed. At the same time, it was clear that to make these valuable resources meaningful and accessible to visitors would require a significant investment of funds. The very scale of the artifacts and historic structures rendered the resource extremely difficult to work with. Fortunately, enthusiasm for the project swelled within the park system, and also among many local community leaders and state legislators. St. Joe and the state mining industry council took an interest, donating funds to assist development. Now, Missouri Mines is well on its way toward becoming one of the most important interpretive centers for industrial mining technology and architecture in the United States. A tremendous amount of work remains to be done, but already the potential has been revealed, and visitors are in for a real treat. Driving down the entrance road from State Route 32 one is immediately struck by the immensity of the mill complex sprawling in the valley, with its powerhouse, headframe and crushers, foundry, machine shop, and all the other buildings utilized for crushing, grinding, and concentrating the ore and for maintaining the widespread operations. Entry for visitors today is through the gatehouse, just as it was for thousands of mill workers for more than half a century. In the mill yard, one is in awe of the aging buildings and all the apparatus overhead, quiet now but still showing the signs of former enterprise. Some of the more significant structures are being renovated to interpret the milling process, others for other historical exhibits. The powerhouse is already an extensive museum of Missouri mining geology and history. The story at Missouri Mines focuses of course on the long enduring boom of the old lead belt, of which the mill was a part, but it reaches out to include the whole story of mineral wealth and its development in the state. It begins with basic geology, which the excellent rock and mineral collection in the powerhouse helps to illustrate. Missouri's underground resources include lead and iron, but also copper, silver, barite, zinc, granite, limestone, and coal. Human use of these resources began with native Americans who quarried flint and mined richly hued ores for the making of palms. The French developed the first real lead mines in eastern Missouri in the early 1700s, and Anglo-Americans joined in with enthusiasm by 1800, utilizing the technological innovations of Moses Austin, who made his mark and went bankrupt--in the Missouri lead region before securing a Spanish charter for a colony in Texas in 1821. After the Civil War, the rowdy, western-style boomtowns of far-southwest Missouri exploited lead and zinc in the Tri-State District, at the junction of Missouri, Oklahoma, and Kansas, but the old lead belt continued to produce as well. The mining districts of the state influenced immigration patterns, encouraging people from mining-related cultures of Wales and central Europe to settle in Missouri, and newly discovered resources of barite in southeastern Missouri and coal in northern and western Missouri began to be exploited. The importance of all this activity was reflected in the state's establishment in 1870 of the School of Mines, now known as the University of Missouri at Rolla, and in 1889 of the Bureau of Geology and Mines, also at Rolla and now the Division of Geology and Land Survey in the Missouri Department of Natural Resources. The late nineteenth and early twentieth centuries also saw upheavals of labor protest and violence hit Missouri's mining industries, especially in the coalfields of north Missouri and in the old lead belt of the Ozarks. Probably the most important developments in our own era have been the discoveries at the Viburnum Trend, the "new lead belt," which secured Missouri's position for a time as the leading producer of lead in the nation and in the world, and the increasing public concern over the environmental effects of mining, particularly in the Ozarks. Mining has been, from the beginning, an integral part of the state's heritage, intimately related to its settlement, development, economy, and environment. Missouri Mines tells the exciting story of that epic saga, amid the hulking structures that were so much a part of it. This essay, printed with the permission of the University of Missouri Press, appears in a book published this fall in conjunction with the 75th anniversary of the Missouri State Park system. Titled Exploring Missouri's Legacy: State Parks and Historic Sites, the book is edited by Susan Flader and co-authored with R. Roger Pryor, John A. Karel, and Charles Callison. It features more than two hundred full-color images by noted landscape photographer Oliver Schuchard and others representing every park in the system. Exploring Missouri's Legacy is available for $29.95 in your local bookstore or directly from the University of Missouri Press, 2910 LeMone Boulevard, Columbia, MO 65201. Phone toll-free 1-800-828-1894. 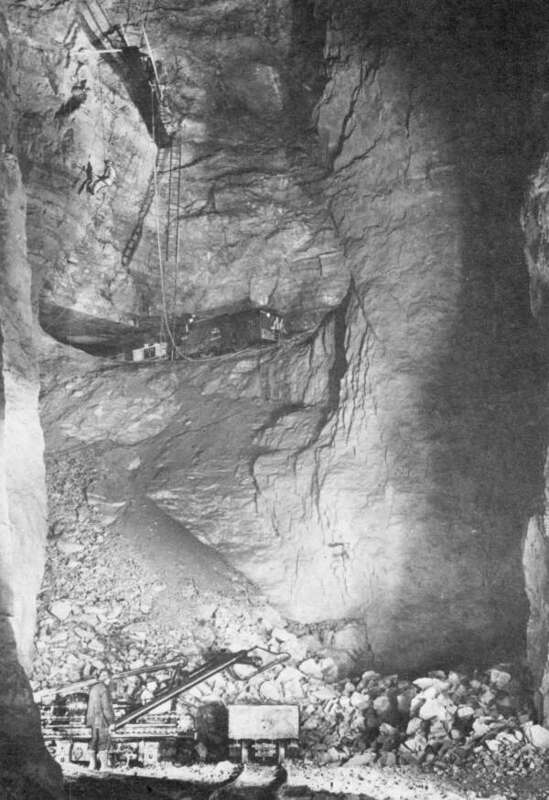 A portion of St. Joe's massive mining operation in 1940, showing a St. Joe shovel loading ore at the bottom, a mainline locomotive on the middle level, and men working from traps above.